New feature: add images to your journal entries! 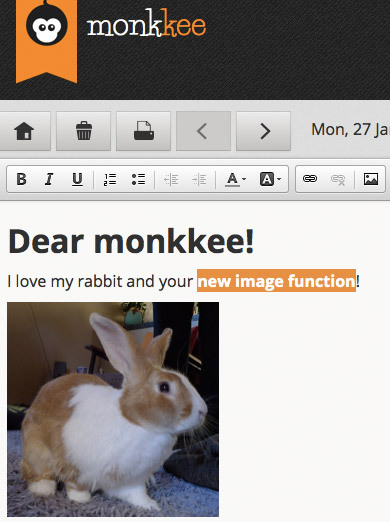 We are pleased to announce that we have added a new feature to monkkee today – you can now insert images into your journal entries! The new feature is free and available for all monkkee users. As your textual content, your photos will be securely encrypted through monkkee’s comprehensive encryption technology, so that no one except you can see them. When you are creating or editing an entry, place your cursor where you would like the image to appear and click the “Image” button on the toolbar. This will open a window where you can upload an image to the system. Choose how to display the image in your entry. Click on the “OK” button and monkkee will insert your image into your entry. We’d love to get your feedback on this new feature. Your comments, praise or suggestions help us to constantly improve monkkee.